Lisa grew up in Cerritos, California and graduated UC Davis, California as a double major in French and International Relations. She loves playing and watching ALL sports, especially softball and baseball. She loves mushrooms and cheese and sunflowers and sunsets. She decided to do the presentation about the Philippines because she wanted to share her personal experience with what was going on over there and let the students know that it was closer to home and that it affected one of their teachers, and not just a random person they may have seen on the news. She also wanted to educate them about the actual events that transpired AND about the country itself, for those who knew little about the Philippines. 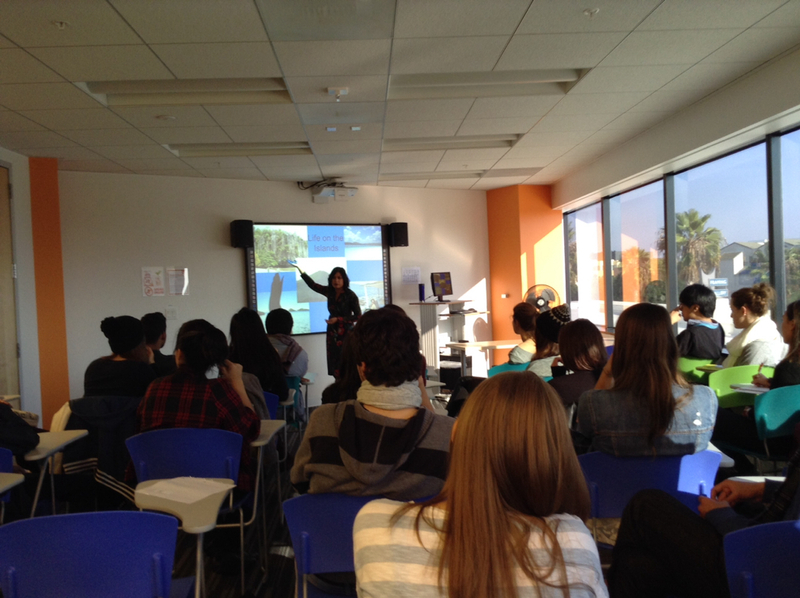 On Friday, December 13, EC Los Angeles English students had a chance to learn more about the Philippines and the typhoon the hit the country. 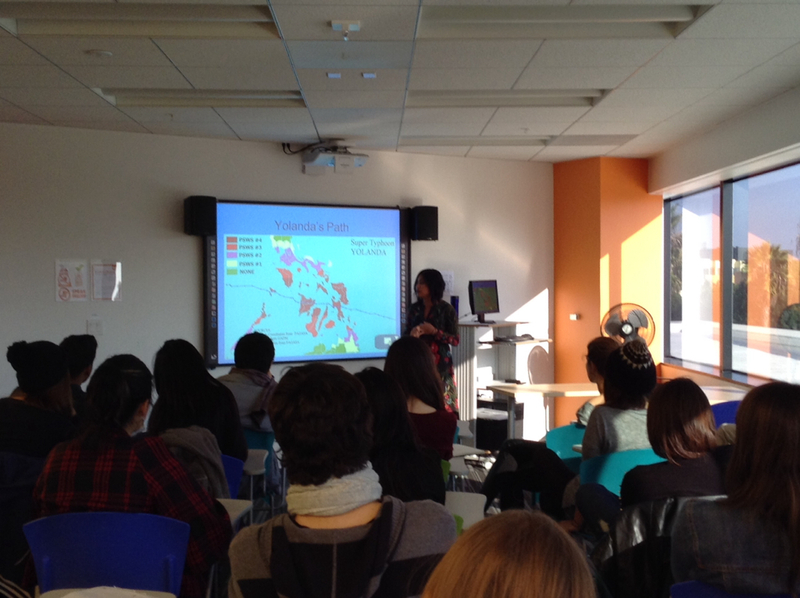 One of our teachers, Lisa Gonzales presented a impressive lecture about the typhoon Haiyan in the Philippines. Lisa gave a talk about life on the islands before the typhoon swept through as well as the aftermath of it. The Philippines, Lisa said, “look like an old man with a walking stick on the map”, consist of more than 7,000 islands. Typhoon Haiyan hit right through the islands about one month ago. To give you an idea of how devastating Typhoon Haiyan was, we can compare it to Hurricane Katrina: Katrina has been called the worst natural disaster in U.S. history, but Typhoon Haiyan is bigger. It is considered to be one of the strongest cyclones ever! The winds and the storm that surged from typhoon Haiyan flattened more than 20,000 homes and forced more than 800,000 people out of their homes. Lisa’s family was also affected by the typhoon. 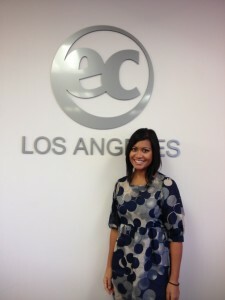 She was not able to get in contact with any of them for about 2 weeks! But luckily everyone in her family was doing well and even helped people in need by packing supplies in factories to be sent out to victims of the typhoon! But there are still a lot of people that that need help! Food, basic supplies, and WATER are inaccessible to people. They need our help! Dozens of aid and recovery groups are working to help the victims of the Philippines. 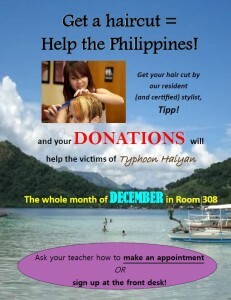 If you`d like to be part of the effort, get your hair cut by our resident(and certified) stylist, Tipp and donate your money. Your donations will help the victims of typhoon Haiyan in the Philippines. Also, ABS-CBN is a reputable source for donation information that you can check. Help Survivors in the Philippines Now! Thank you for your great lecture Lisa!